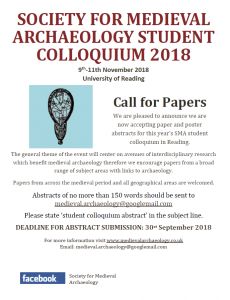 The Society for Medieval Archaeology Student Colloquium 2018 will be held at the University of Reading, 9-11th November. Please send abstracts of no more than 150 words to medieval.archaeology@googlemail.com before 30th September 2018. Please include ‘Student Colloquium abstract’ in the subject line. The theme of the colloquium is interdisciplinary research; therefore, we welcome papers discussing medieval archaeology from any discipline. Papers with a traditional approach will also be considered. Abstracts from across the medieval period and all geographical areas are encouraged. Follow the colloquium’s Facebook page for updates.